This got a little long – skip to the end for cliff-notes. Making a low-Q Fat-bike is a little complicated – which is why no one else does it – there are a lot of constraints to design around when you are squeezing 3.8” tires into a frame with a 73mm BB shell and nominal Q of 172mm. We know it works great – goat has put nearly 14,000 k on his, exploring all over the world. But not all cranks/ gearing setups fit – and that’s what this article is about. Turns out that there is a wider range of options than we had expected! Almost any MTN cranks will fit – We’ve tried SRAM, RaceFace, Shimano and Surly, and White Industries cranks; in fact, the only cranks we’ve found that don’t work are Surly ‘Mr. Whirly.’ Most of the cranks tested have been 25mm hollow spindle 2-piece cranks – but older square taper cranks should work just fine (with the right length BB spindle). And most BB30 cranks should fit as long as you use the right BB (we have only tried the White Industries m30). Chainline, it turns out is the real limiting factor – because, chain line is pretty much the same thing as tire clearance. Which is where things start to get a little more complicated. Especially if you want to run (full) Fat tires. So let’s start with tires. The ScapeGoat is designed to fit 26×3.8” (4” nominal) tires on 80mm rims – but it works equally well with 27.5(650b) Plus (3” nominal), 29+ (29×3.0”), and standard 29er wheels. And it even fits 26×4.8” (5” nominal) tires (on 80mm rims) though the clearances in the rear end are so tight, and the sweet spot (where the tire/chainstay clearance is best) so short, that we can’t really recommend you do it (plenty of room for 5” tires upfront though). That’s a lot of wheel sizes – but the purposes of chain line/tire-clearance, there are only 2 groups. Full Fat (4” nominal), and Plus (3” nominal). For Plus, tires you need a CL of 54mm( or wider), and Fat, a CL of 58mm or wider The take-away though, is that wider is better. The ScapeGoat is 1x specific, but the 1x chain line ‘standard’ of 50mm is too narrow (it works with some Plus wheelsets, but is a little close for comfort)– fortunately, there are a couple ways to get the sort of chain lines that make the ScapeGoat happy. The easiest is to use a single chainring in the OUTER position on a Tripple, or Double (2×10 style) crankset. Though the smallest chain ring that will fit on most of these cranks is 32t – which depending on your riding style can be a little limiting. The more ‘modern’ way, which offers a ‘cleaner’ look and as small a chain ring as you might want, is to use a non-dished, or reverse-dished direct mount (DM) chainring. RaceFace, Cannondale, White Industries, Hope, etc; all make easily flip-able, dished DM chainrings (the chainring teeth are offset ~16 mm from the mounting point and are designed to move the chain line IN toward the frame, but if the cog is reversed – they give a nice wide chainline). SRAM is a little harder; SRAM-compatible DM-chainrings (such as those by WolfTooth) are available dished, but are less easily flipped (you need different (longer) mounting bolts with low-profile heads (disk rotor bolts work pretty well)) though we are working on flip-able SRAM-compatible chainrings to solve this problem. 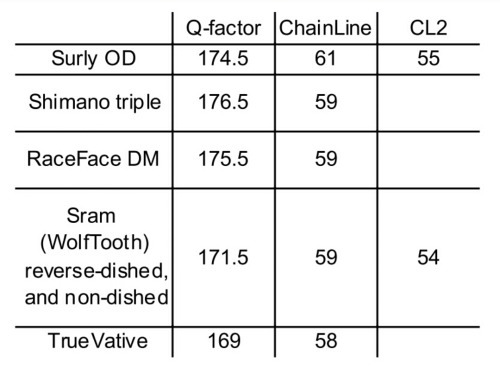 Here is a little chart showing Q-factors and chain lines for some of the cranks we’ve tried. With cranks and drive trains out of the way, it’s time to talk about drive trains. With Plus sized wheels, you can run whatever gearing you might want; fixed gear/SS all the way through 12speed. The Scapegoat is a 1x bike (no provision for front derailleurs or multiple chainrings) but you asked, l checked, and you can run a Surly OD (offset double) with your Plus wheel/drivetrain of choice. If you are going full Fat, your drivetrain options are more limited. The cleanest/easiest options are to go internally geared, or SS. With the Rohloff Speed Hub being the best internal gear hub choice, in terms of gear-range, durability, and chainline. For single speed we recommend SS specific short-cassette hubs (goat’s personal favorite is the Hope Trials/SS hub) so you can dial in the chainline. It is possible to use derailleur/cassette gears but space is limited, and you have just enough room for 7 gears at 11speed spacing (or 6 a 9speed spacing, 5 at 8speed spacing) but since no one sells such a cassette *yet* (were working on it) you’ll have to check out goat’s forthcoming how-to and make your own – he just put 1000+ miles on such a setup on the Baja Divide. As always, direct any questions/confusions to goat@crustbikes.com. Scapegoat builds can be divided into two categories, Plus, and Fat.